Fostering positive relationships with our senior students is something we take very seriously at the Springs. Part of our work with our Year 6 students is our Buddy Program. 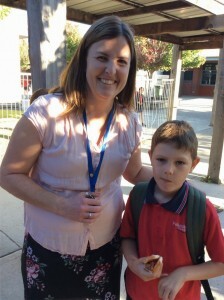 Each staff member has at least one Year 6 buddy. Buddies were announced last week and I enjoyed my first visit with mine as we had a casual meet up to get to know each other. Once a term we hold a Buddy Breakfast before school. These are a great way to connect with our buddies and enjoy a sausage and juice together.